A while ago a friend from school found this in her School yearbook and sent it to me. It was one of my first attempts to write a rhyming message. Very poor spelling and subject matter !! I do treasure this as there isn’t much to be found of my writing back then. Who would know that I would one day love to write and end up doing freelance writing with the dream to one day write a book. 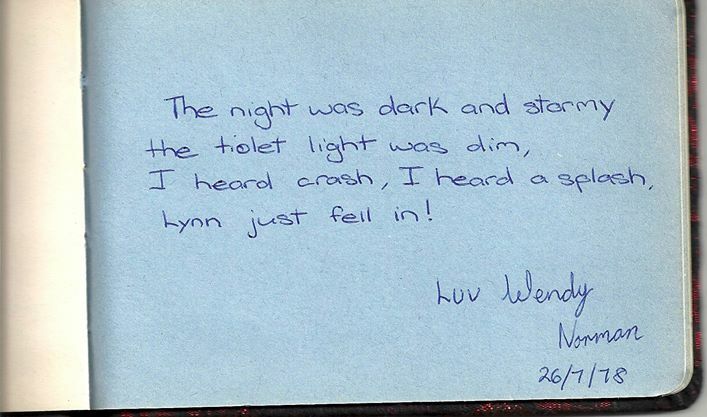 Do you have any funny or special hand written notes from your childhood you wish to share? Oh lord… I’ve stumbled across some of my high school utterances and I swore that I didn’t know who this young man was! What an awesome piece! Of course 🙂 I have. Good I think you should share haha if you dare!